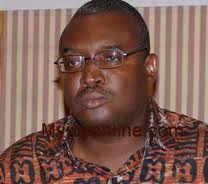 Kobby Acheampong is the Deputy Minister of Tourism in Ghana. Barely 48 hours after displaying what could probably pass for “arrogance of the highest order”, deputy Minister of Tourism, Kobby Acheampong, has apologized for his infamous ‘Kookooase Kurasini’ comments which incensed a section of Ghanaians, especially Kumasi residents. The embattled deputy Minister’s insult was directed at the New Patriotic Party (NPP) General Secretary, Kwadwo Owusu Afriyie aka Sir John. His controversial comments sparked off anger in the country particularly among some residents of Kumasi and the cocoa growing areas resulting in heated media debate. The minister’s comment received wide condemnation with farmers’ associations and Members of Parliament from cocoa-growing areas joining in the fray while some residents of Kumasi even went as far as banning him from the Ashanti Regional capital because they interpreted Mr. Acheampong’s comments to mean Kumasi residents are ill-mannered. But on Wednesday, Kobby Acheampong was reported to have ‘tip-toed’ to Kumasi in the company of NDC General Secretary, Johnson Asiedu-Nketia, where he granted an interview to Kumasi-based Fox FM rendering an apology that all who felt insulted by his comments should forgive him because he had no such intention of insulting them. Kobby pleaded that he is an Asante himself, born in Kumasi, with his father hailing from nearby Asante-Mampong and would not therefore have insulted his people. “If you feel offended, let bygones be bygones, I didn’t intend to insult anybody and I was very specific, it was on Sir John [so people of Kumasi forgive me]” he concluded.